Endogenous money advocates often think that a central bank is required in order to offset increases in government borrowing. The story goes: the central bank targets the overnight interest rate by buying up government securities; if the government issues more debt in the form of securities to increase spending the central bank will soak this debt up to maintain the target interest rate. Thus government spending cannot cause higher interest rates. Rather the interest rate is set by the central bank. This is a nice story. I tell it myself sometimes. It is easy to communicate and it usually causes anyone arguing otherwise to pipe down. But there is a much simpler and more fundamental argument for endogenous money. It is the one that we can use to explain the historical statistics in various countries. Let us turn to these first. Now, we know today that the central bank targets a rate of interest and buys government securities but it is not so clear that this is what happened in, say, Britain in the 19th century. They operated under a gold reserves system and the central bank had not yet articulated its own role as setting the rate of interest. Yet, the Bank of England have clearly shown in a fantastic paper entitled The UK recession in context — what do three centuries of data tell us? that government borrowing in the UK never really affected bond yields. Take a look at the graph below from the paper. See that red circle? Well, that is an era in which government deficit-financing is rising enormously while the interest rate on bonds… falls! That seems somewhat at odds with the hoary old tale that rising government spending not backed by rising taxes leads to a ‘crowding out’ of investment and hence a rise in interest rates now doesn’t it? So, how do we account for this? Well, it is quite simple really: when the government sells securities to the private sector the money that it receives gets spent back into the economy. This means that it accrues in someone else’s bank account. Thus the net amount of reserves in the system does not actually change. The effects on interest rates come from another sector entirely. Let us first look at the above statement in more detail. Now we know that the primary bond dealer’s cash has been depleted by £100 and the policeman’s have been increased by £100. Meanwhile the primary dealer’s financial assets (excluding cash) have increased by £100 and the government has incurred a liability of £100. The total amount of private sector cash savings remains identical to before the transaction. Because the government spent the money it borrowed back into the economy it effectively just transferred cash savings from the primary bond dealer to the policeman. This means that if a private company want to borrow they will find the same amount of money in existence as before the government undertook the transaction. They will just have to approach the policeman (or his bank) rather than the primary bond dealer if they want to borrow it. Another way to put this is that: deposits remain the same. The primary dealer loses a bank deposit and the policeman gains a deposit. And if the aggregate level of deposits in the banking system remain the same then why would there need to be an increase in bank reserves to accommodate? Simple answer: you don’t. This is where the money multiplier becomes a sort of fallacy of composition. Reserves are held against deposits, so if deposits in the aggregate remain the same then there will be no need to increase reserves in the aggregate to accommodate the lending and borrowing. In the example we have given shows the borrowing by the government does not increase deposits. Deposits remain the same. Where do the potential effects on interest rates come in then? Simple. The stock of government debt has increased. In a typical supply and demand market if the quantity of a good increases its price falls. So, if the quantity of government debt rises then its price should fall and its interest rate should rise. This could, in principle, drag up interest rates on other securities and cause a general rise in the rate of interest (this is by no means clear but it is a possibility). 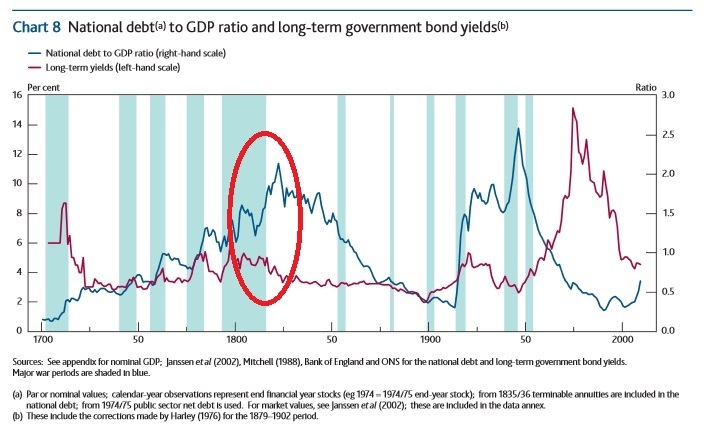 So why then did the yield on government debt in the UK in the early 19th century fall as the stock of government debt rose? Quite simply: confidence. People had confidence in British public debt since the Bank of England was established in 1694. (See here for a potted history). People didn’t much care that the stock of public debt was rising because they believed it would be paid off. So, even though the government ran up massive debts and massively increased the supply of government securities the price on these securities remained the same. This was likely helped to some extent by increases in savings held by exporters (but the current account surplus in this era was by no means large enough to explain this alone). That is not how financial markets work. They are not price versus quantity markets. Rather they are price versus perceived risk markets. And this ties back into Keynes’ theory of financial markets. To put it very briefly: if people are highly confident in the financial markets and there is a fixed amount of money in those markets the velocity of the money in the financial markets can speed up to accommodate any increase in the flow of borrowing. This is actually very obvious but mainstreamers don’t dig very deep into these things generally. This blog post is long enough but I have fully formalised Keynes’ theory in the book that I am nearly finished writing. I think that this is the first time it has been done. Since I have given more than enough content away on this blog for free you will have to wait until it comes out, buy it and then you can get a better grasp on Keynes’ theory; the only theory that really fits with the historical record in this regard.